Multi-level drying units, designed and manufactured by ERBA, have from 6 to 10 levels, depending on the capacity of plasterboard production factory. Dryer is used to dry the plasterboard in order to gain strength. Therefore, our dryers have a fragmented structure and their capacities can be increased according to customer request. There are fans that provide transfer of the hot air from burner into the dryer, to every levels of dryer. 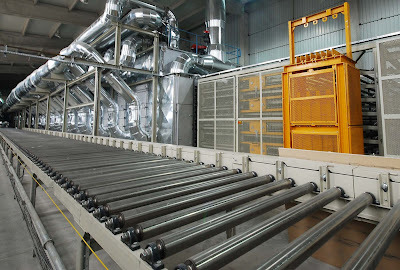 5.6% of heat recovery is achieved with using stainless steel heat exchanger. Travelling speed of plasterboard on conveying systems and the speed of the dryer is synchronized in feeding machines. Also, gap between the transferred plasterboard is cleared automatically. Dryer outlet makes plasterboard sequentially and it concludes drying process before trimming and stacking on pallets. Humidity and temperature values can be controlled. With electronically control system, made by our automation team of experts, all drying flow has become processable and treatable.